What is the organizing principle of the Fasti? Where do Pyramus and Thisbe plan to meet outside their homes? Which of the following is true of the Baucis and Philemon? a. Philemon would swim the Hellespont each night to visit his beloved Baucis. b. They were an old couple rewarded for entertaining Zeus and Hermes unawares. c. They were lovers forbidden to marry one another by their parents. d. Baucis was tormented with forbidden love for her brother Philemon. What was the fate of Alcyone? a. She drowned during a storm at sea. b. She was loved by Poseidon and bore twin sons. c. Centaurs attempted to carry her off at her wedding. d. She was transformed into a seabird that nests upon the wave. Who was transformed into a fountain pining for her beloved brother Caunus? Who raped then married Flora? Which is Ovid's only work composed in the epic hexameter? Who came to Pomona disguised as an old woman? What work of Ovid's is composed of fifteen letters from mythological heroines to their absent lovers? Who wrote the Thebaid and the Achilleid? Which poet was one of the most famous members of the group of new poets called by poetae novi? Who was the greatest of the early Roman poets, celebrated for his epic treatment Roman history in the Annals? 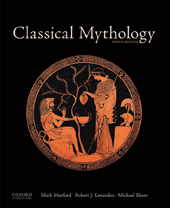 What former slave wrote an adaptation of the Odyssey and was crucial to the spread of Greek mythology in the Roman world? What was the Greek equivalent of Augustus? What was the first and greatest of the Roman temples? The Etruscan deities Tin, Uni, and Menvra were assimilated with what Greek and Roman deities? To what does Magna Graecia refer? a. The name given to the Greek settlements in the boot of Italy and the eastern coast of Sicily. b. The name given to the Greek settlements in the Peloponnesus. c. The name given to the Greek settlements on the coast of Asia Minor and the Black Sea. d. The name given to the Greek settlements in northern Africa.